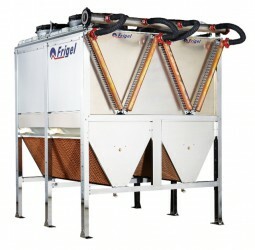 We are the agent for southern Germany of Frigel Firenze´s German sales organisation. Located in Rheinfelden, Germany, Frigel GmbH provides manufacturers in Germany, Austria and Switzerland with cooling technologies backed by service and support to optimize their processes and increase sustainability. Based in Florence, Italy, Frigel Firenze SpA designs, manufactures and services advanced process cooling equipment for customers worldwide. With a total of 5,500 references worldwide, Frigel’s global manufacturing and technical center footprint is located in five key locations: Florence and Milan, Italy, Bangkok, Thailand, Limeira, Brazil and Chicago, USA. Foremost among Frigel’s products is the Ecodry system, a unique, closed-loop intelligent cooling system, which is proven to dramatically reduce water and energy use and maximize productivity and sustainability in thousands of installations. Frigel also provides high-efficiency central chiller units as well as a full range of precise machine-side temperature-control units to meet specific needs of diverse applications.